The F.P. 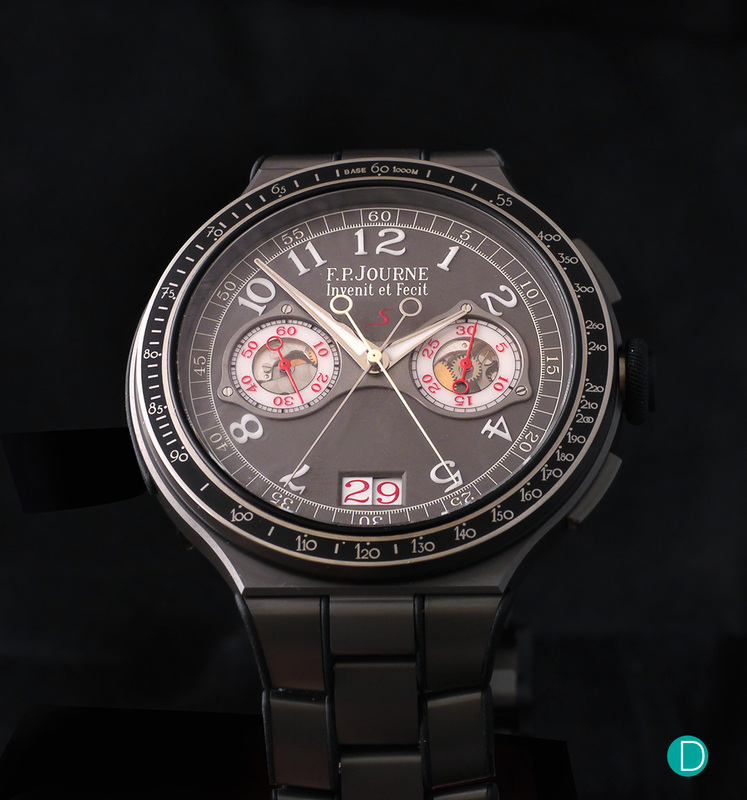 Journe Chronographe Monopoussoir Rattrapante was announced in SIHH 2018. It stood out for several reasons, one being that it is offered at an amazing (low) price, especially after the model debuted as a piece unique in Only Watch 2017 at more than CHF 1million. 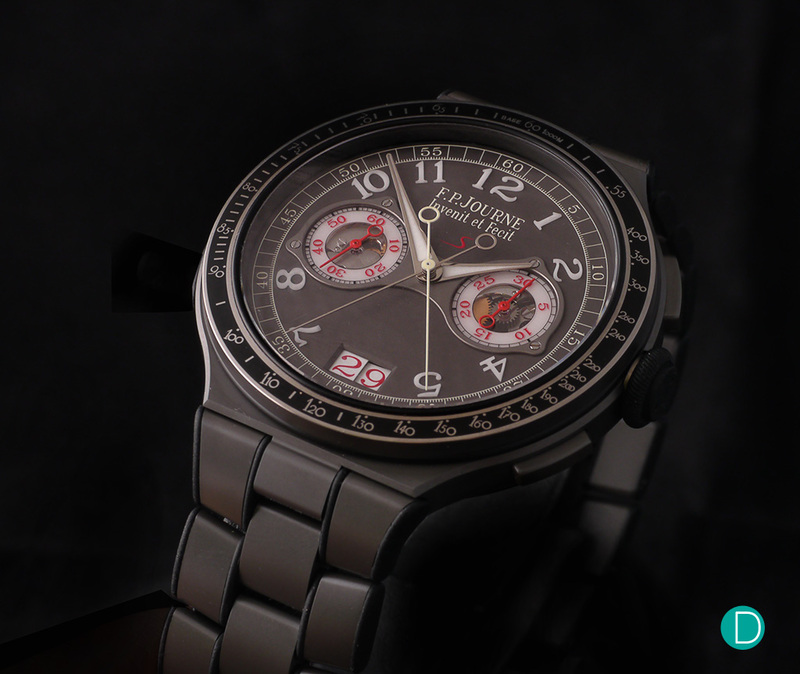 Here we bring you the hands-on, analytical review, and tell you why this might be the split seconds chronograph for the astute. François-Paul Journe is often described as the enfant terrible of the industry. But he has certainly mellowed over the years, and as the person mellowed, so has his products. His watches now are much more refined, much more sophisticated than ever before without losing the edge. And perhaps other than the Chronomètre Optimum (recommended reading as it outlines Journe’s early years and mindset) and the Vegabondage series which we so loved, the Chronographe Monopoussoir Rattrapante is the pinnacle of this philosophy. 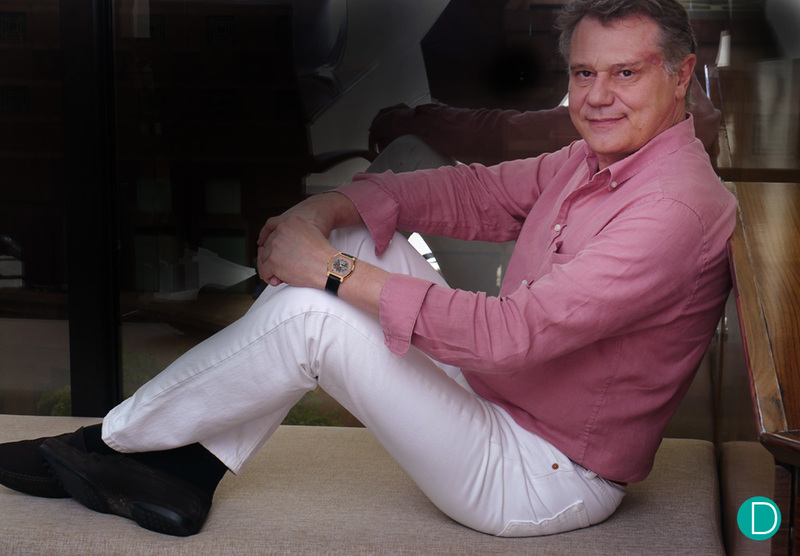 François-Paul Journe, photographed in Singapore. August 2017. 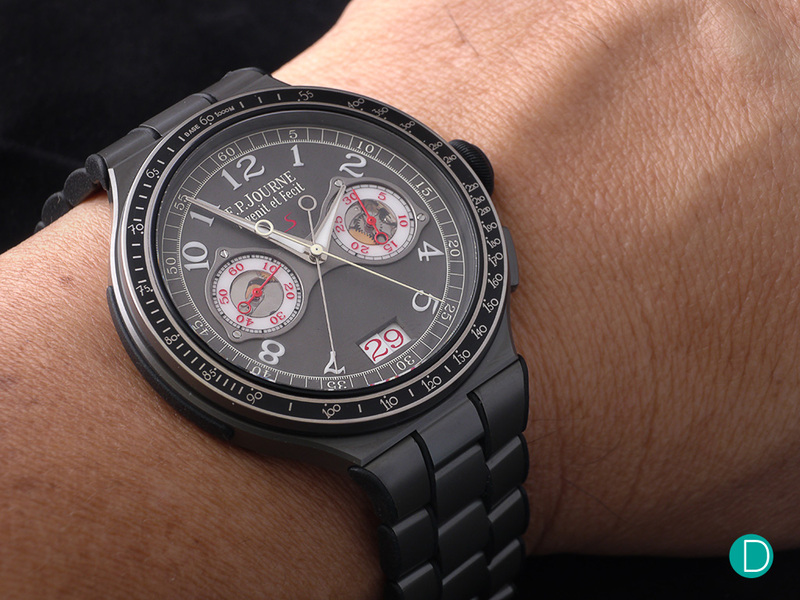 While the Chronographe Monopoussoir Rattrapante is certainly not the first of F.P. Journe’s chronographs, that milestone being the equally provocative Centigraphe Souverain, this is the first split seconds to be produced by the maison. And typical of Journe watches, it sports the unique signature aesthetics, and perhaps a cheekiness at interpreting the status quo. The Chronographe Monopoussoir Rattrapante is announced to be available in red gold, platinum and in titanium. We spent considerable time with the titanium edition recently. The case is the signature Journe case. Sleek, elegant, with smooth somewhat sensuous lines. 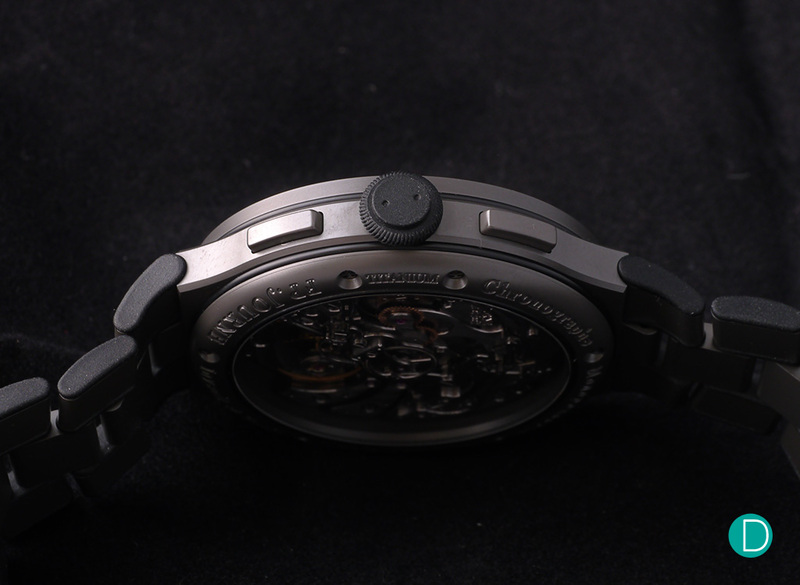 The titanium cased version review comes with a dial in aluminium alloy of anthracite colour with appliques numerals with Superluminova. A large two panel date display shows the date at 6 o’clock. Note the two panel date, which shows the digits at two different planes. The 2 chronograph counters in engraved sapphire and affixed on the dial using the shaped rings that have become a hallmark of Journe design. This provides a three dimensional feel to the dial. And while this feature is sometimes a bit funky in the early days, Journe has continually refined it, and now it looks quite beautiful. The large Arabic numerals which mark the hours are in Superluminova, and a railway track surrounds the dial, marked at 5 minute intervals. The hour-minute hands are classical Journe hands, while the counter, the continuous subsidiary seconds hand and the twin chronograph hands are slim, sleek needles which extend to a circle as a counterweight. 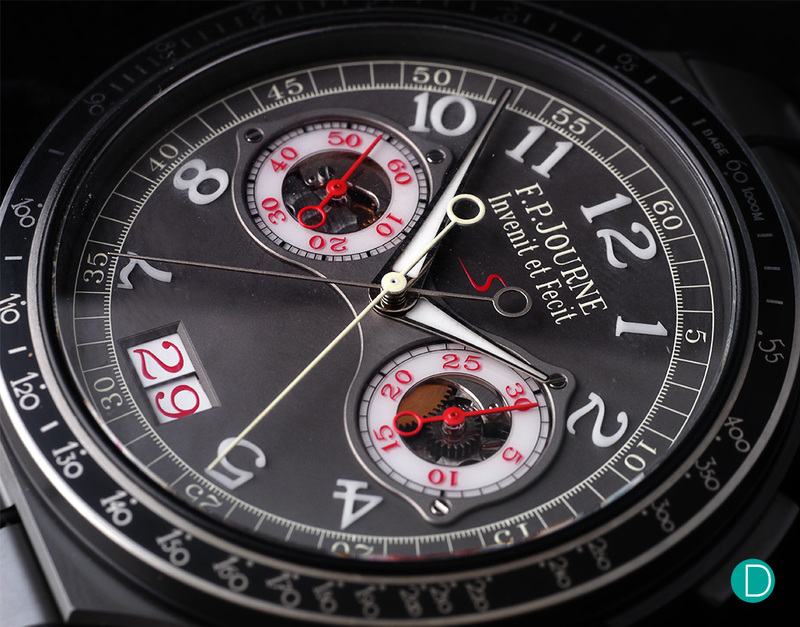 The chronograph hand is painted white, and when the chronograph is in operation in rattrapante mode, the split seconds hand is in a darker hue. 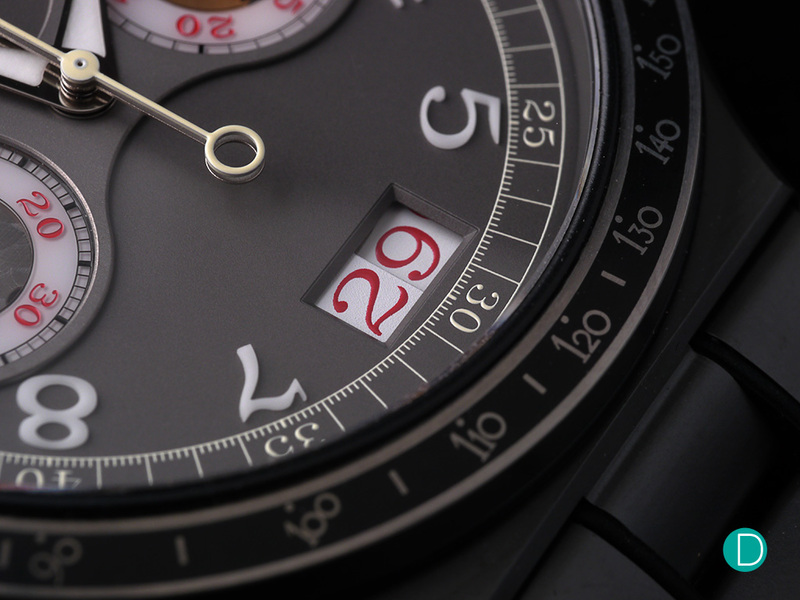 We find the elective use of bright red to highlight some aspects of the dial design is rather tasteful and effective. The large rubber overmoulded crown sets off beautifully against the sleek rectangular pushers and the sensuous curves of the case sides. The bezel is marked with a tachymetric scale, and is in-laid with ceramic. And the crown is wrapped in a rubber overmoulding. The crown can be set to 3 positions for winding, date-setting, and time-setting. The pushers at 2 and 4 o’clock are made of the same metal as the case (platinum, red gold or titanium); the former starts, stops and resets the chronograph while the latter actuates the rattrapante function. The movement which is designed and manufactured in-house at F.P. Journe is rather interesting. The early Journes were equipped with standard brass movements. As Journe gained famed, and fortune, he began to make the movements in rose gold, and remain perhaps the only manufacturer to do so. 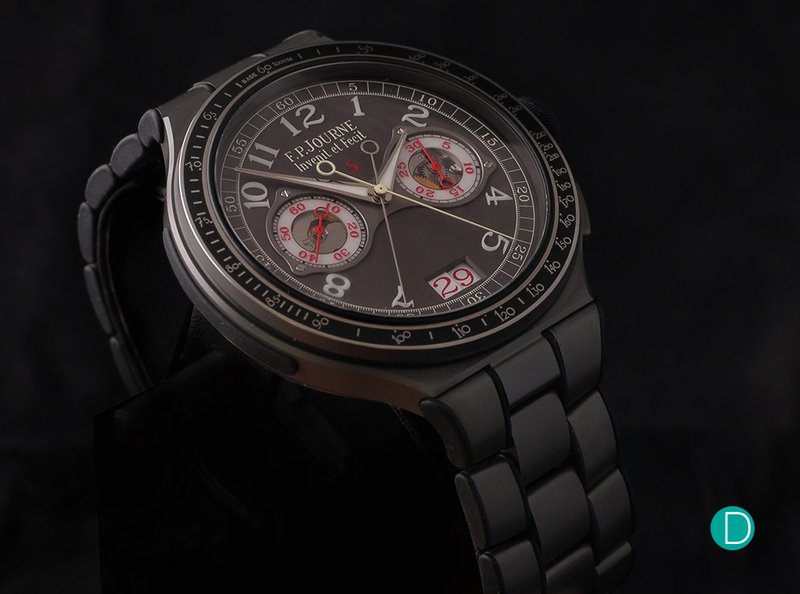 The C.1518 on the Chronographe Rattrapante goes one step further. The movement is constructed in aluminium. As can be seen in the photograph above, the aluminium movement is highly embellished with traditional haute horlogerie finishing. These include circular stripes on the bridges, perlage on the baseplate, polished screw heads with chamfered slots, pegs with polished rounded ends and straight-grained steel parts. As is typical for a split seconds chronograph, two column wheels are employed to control the functions, and the chronograph works are in traditional stainless steel. The steel parts are also magnificently finished, with black polished surfaces, proper anglage and polished countersink sides for the jewls. The overall finishing is magnificent. and this shows in the operation of the chronograph. The feel of all the buttons in operation are positive, yet light. The pressure required to start, split, catch up, and reset are all judged to be quite equal, and this is a testament to the skill of the watchmaker who crafted the watch. The Journe LineSport Monopoussoir Rattrapante first saw light of day as the brand’s contribution to the Only Watch Auction of November 2017. The piece unique offered for sale in that auction is in a red gold case, and sold for CHF 1,150,000. The series production is offered at a rather attractive prices: in Platinum – S$165,800 with GST or CHF106,000, Red Gold – S$122,000 with GST or CHF 78,000, Titanium – S$90,800 with GST or CHF58,000. We find the titanium version to be particularly attractive in pricing, and perhaps is one of the best value for a split seconds chronograph with single button activation and with an in-house manufactured movement. The landscape for a split seconds chronograph operated by a monopusher is rarified territory, Of those we surveyed, we these inhabitants, which as usual are by no means exhaustive, but rather an indication on what is available in the market. 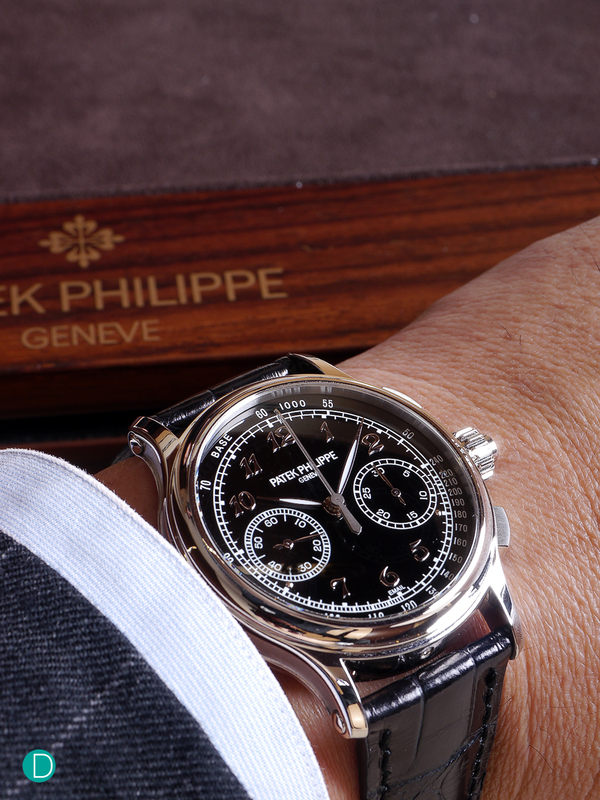 Patek Philippe 5370 Split Seconds Chronograph (S$328,500 incl GST in Platinum) is not a monopusher, but perhaps represents the establishment in watchmaking. The Patek Philippe 5370 on the wrist. Case diameter is 41mm. Perfect on the wrist. The 5370 is also monopusher, and commands a great presence on the wrist. 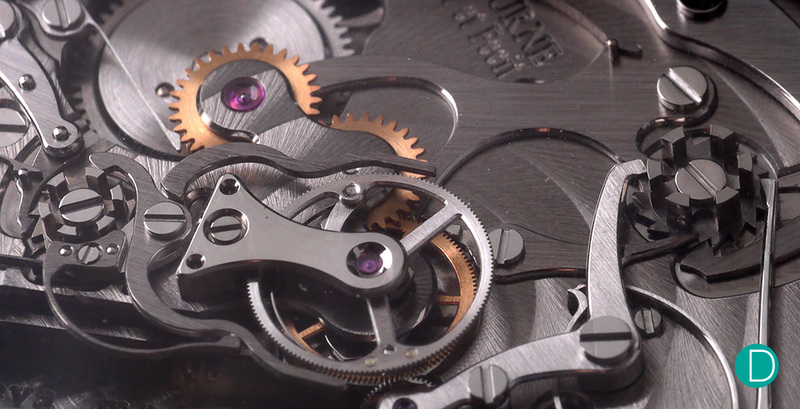 The movement is well constructed, as is typical for Patek Philippe, and is finished at top drawer levels. This is reflected in the asking price. However, we also need to note that there is an attendant high demand for the watch despite the high price. 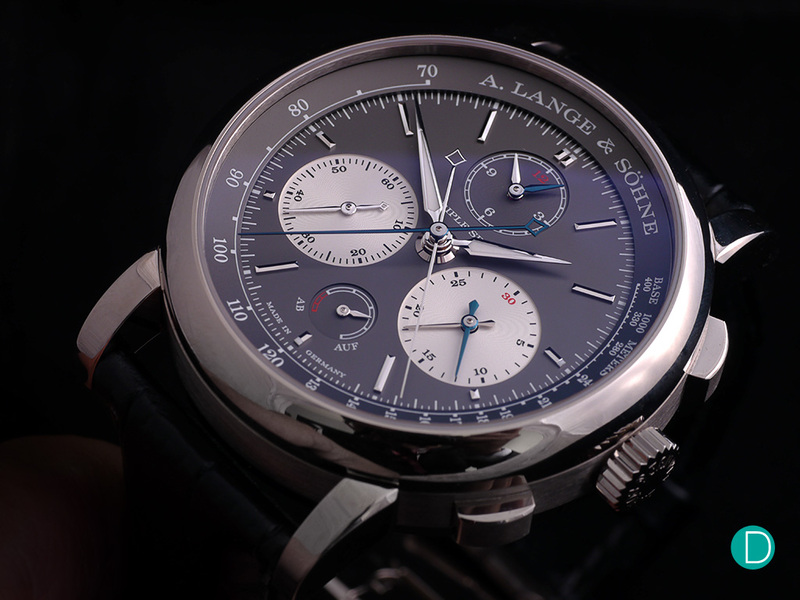 A. Lange & Söhne Lange Triple Split (€139,000 inclusive of German tax in White Gold) and the Double Split at € 128,000 in pink gold). Both are split seconds chronographs. The Double Split provides split timings up to 59 minutes, while the Triple Split provides split timings for that and up to 11 hours and 59 minutes. Both feature instaneously jumping counters, and neither comes with a date. But neither offer a monopusher activation. The aesthetics are rather more teutonic than the Journe’s (and perhaps arguably the Patek’s) more French styling. Movement is, of course, top grade as one would expect from Lange. The design is exceptional, and the finishing is one of the best in the business. Perhaps on a different planet, the most competent budget split seconds chronograph in the market is the Habring² Doppel 3 Split Seconds Chronograph (S$10,500 with GST or € 6,750 in stainless steel). The Habring² Doppel 3. 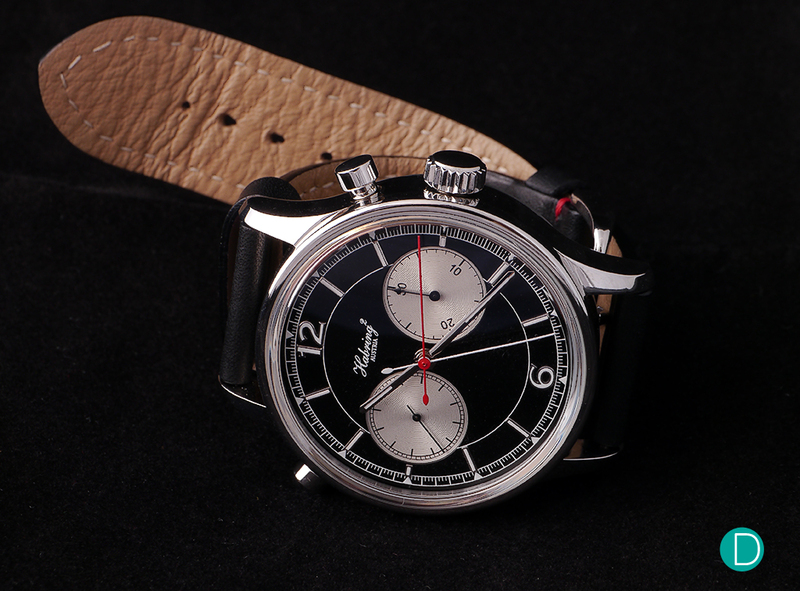 The Doppel 3 is the third generation of split seconds chronographs from Habring² , following in the footsteps of the GPHG winning Doppel 2. Also not a monopusher, it is also sans column wheel, as the Habring innovation is based on the venerable Valjoux 7750 and its variants which use a cam instead. The Habring² does not have a date module either. But the magic is in the clever aesthetics, which we are rather fond of. And the genius of Richard Habring to be able to simplify the most complicated of movements into one which is commercially inexpensive to produce in larger quantities. The package of the F.P. Journe Chronographe Monopoussier is compelling. 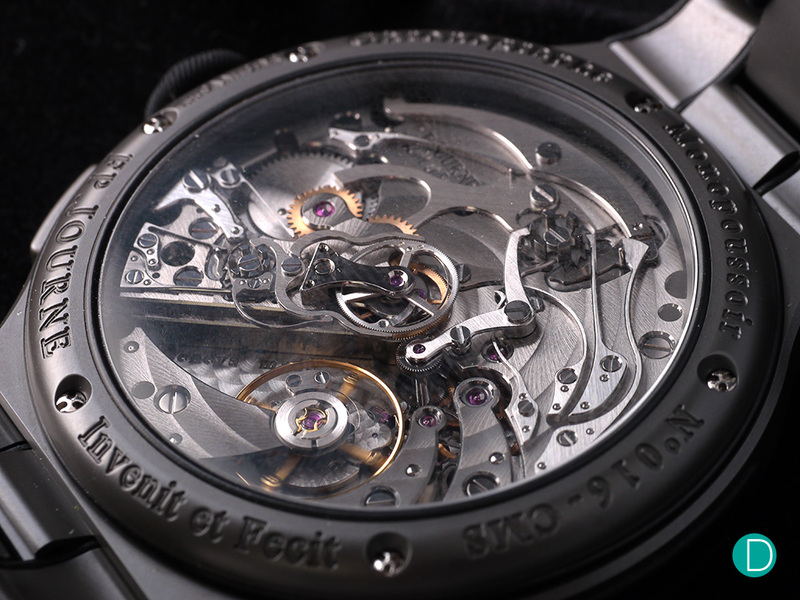 Here is an in-house manufactured movement from a maison with pedigree. Beautiful aesthetics, easy and good legibility. Excellent, smooth operations. And which has the added distinction of achieving a very high price in the Only Watch Auction 2017. Plus a really attractive pricing for the titanium edition. Hence, we dub it the Dragon Slayer! Highly recommended! The sensuous lines of the case curve around the wrist, and makes the 44mm diameter wear much smaller. The titanium version is ultra light, and feels very comfortable. Titanium – S$90,800 with GST.